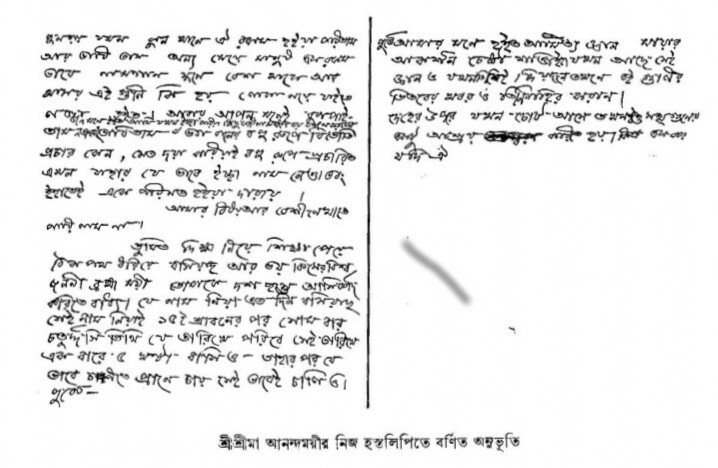 Sri Ma’s words about her own handwriting. “Whatever mental disposition we demonstrate before Ma, most of the time she becomes one with that. 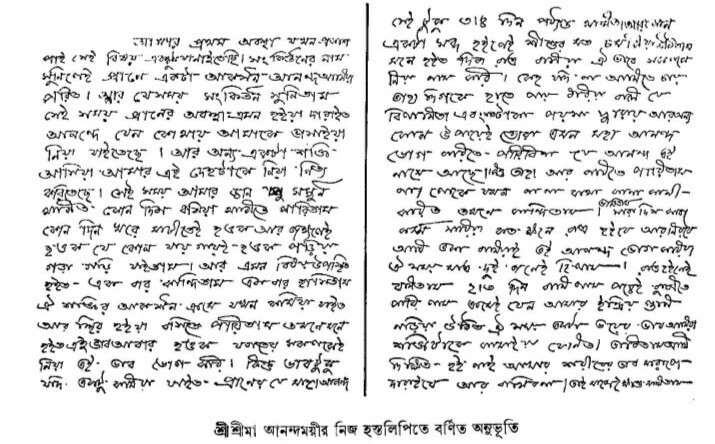 With reference to that Ma was saying, “You have been witnessing different styles of (my) handwriting, the reason for that is: once while seeing Kumudini, the aunt of this body, was writing I sat to write the same way- it seemed to me that the fonts got smaller like those of hers. Again when I wrote keeping in mind my father’s handwriting I noticed that the style of writing was becoming like that of father. Again, perhaps without being aware of anybody when I used to write keeping in mind the printed alphabets, just to make the alphabets look similar I had been writing in a special way, each letter starting from a fixed point. Any deviation was not to my liking. O Supreme Purush who art established in this world in the form of husband, wife, mother, children and in all other forms. I see that every thing is enveloped in Maya [ delusion] and attachment.The is no cause for despondency. Remain steadfast on the path with a pristine heart, unmoveable faith and a desperate thirst.You shall assuredly discover your own self. O Father, the Absolute (Parampita), you are moving about as the restless universe, as couples, as parents, as offspring, and as all diverse forms. But you appear to be covered under the veil of ignorance (maya) and attachment (moha). No matter there is still enough scope to come out of the veil. Pick up single-pointedness in your attitude, firmness in your confidence and deep sincerity for your quest, and take up your journey. You are sure to reach your goal – your own true self. Strive for being good. This mercy I beg of you all. I am letting you know a little bit about the state when it started manifesting for the first time in me. Just on hearing about sangkirtan there appeared some sort of attraction and happiness (in my) heart. And when I was listening to the sangkirtan the heart stood in a state as if I had been floating away somewhere in the stream of bliss. And (felt) thaIt a different force was dancing with my body. In that state I was totally conscious. Some days I could sit and on some other days whether I ere hearing about Sangkirtan (holy songs/singing the name of god aloud in chorus) there appeared an attwas in the room or in the jungle, wherever I had been, I used to roll on the ground. And such a state would come that at one time I would cry and at another time I would laugh. When the attraction of that force gradually receded then I was able to sit motionless and it happened in the mind that the state should come again and I would enjoy the state along with everybody in the world. But when the intensity of the state was a little less the feeling of great joy at heart continued for 3 / 4 days. And whenever there was any sound I would startle like a child. I would think that sitting all throughout day and night I should sing the name (of God) accompanied by everyone. If anyone was reluctant to come, touching their hands and feet I would tell them, you would not be able to enjoy such great bliss which is there in the name ,through luxuries (of life) and spending hundreds of rupees. But I could not express it. I would weep when people around were whispering (about me). I would imagine nightfall after daily chores are complete and I would silently sit alone and enjoy the bliss. During that period only two of us (Bholanath and I) were there. I would sit when it was night. I sat for 2/3 days. Thereafter I could feel that my senses were gradually shaken up and a sort of fear would lessen that force. I would cogitate that as I do not have Diksha (religious initiation), lest the condition of my body would get worse, I would not sit any more. Sometimes I would restrain myself. Again somewhere else (Note: When Ma was invited to attend kirtan in the neighborhood) that state of being would come (during Kirtan) I would think that while other women hear the kirtan and stay normal but what are all these happening in me (!). I felt ashamed to go in the midst of people. Again I consoled myself. And it happened in my mind that when I don’t act willingly the Great Benefactor will do good. I would think about the reason why God’s divine qualities are manifested in various forms. Verily, He out of kindness projected (Himself) in different forms. Now (you) take names the way you want and ultimately those (manifestations) become one. After 15 Shravan (4th month of the solar Bengali calendar) the day when there the Tithi Chaturdashi( 14th day of Lunar calendar) falls on Monday, sit with the name with which you sat for practice so far, for five hours at a stretch. After that follow the way your heart wants to proceed. On different occasions in the past it occurred in my mind that when the concept of egotism, the attraction of Maya(delusion) and power to try to act are there and the understanding ( of all these) had also been given by Him then He also brings into the light the underlying implications of all these. 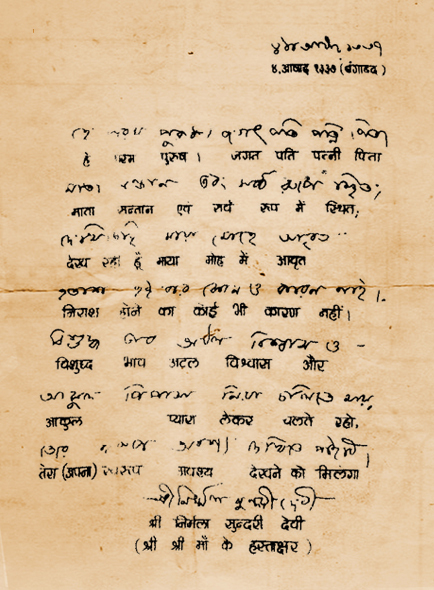 Communication from Sri Ma to Prangopal Mukhopadhaya in 1924/25 in response to his earnest desire to know her spiritual state from her own lips.The original letter was handed to Sw Nirvanananda (the first Ascetic Sangha President) by Prangopal’s son, Dr Govinda Gopal.